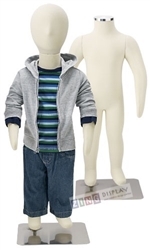 Our unisex abstract child mannequin has soft facial features and molded hair. Featured in a playful arms out pose with a glossy white finish. Made of fiberglass. Base included.